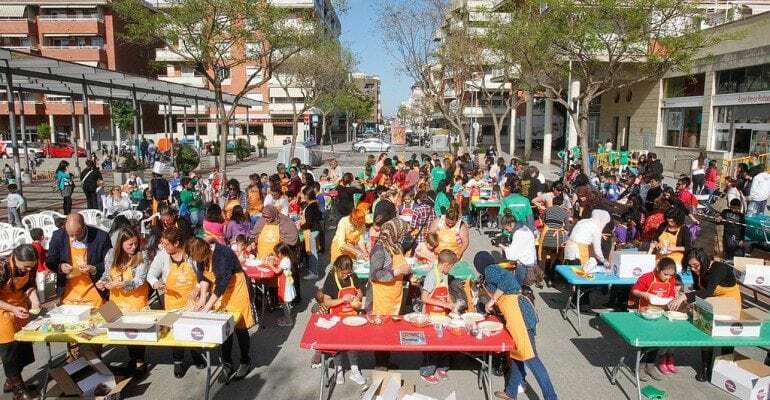 The theme chosen for this year’s International Family Day celebration was ‘Family Meals.’ The event was celebrated on May 11th in Sant Boi de Llobregat (Barcelona), the hometown of ourfounders Pau and Marc Gasol. This event was intended to strengthen the role of parents in teaching their children the importance of healthy lifestyles. Gasol Foundation, the Department of Family Services of the Generalitat de Cataluña (regional government), Sant Boi de Llobregat local government, Marianao Foundation, Cassià Just Foundation and Probitas Foundation, who share this common goal, joined forces to organize an unforgettable, educational day full of activities. After a family batucada, the cook, Ada Parellada, and writer, Anna Manso, explained to the attendees, through the use of humor, the basics of family education and healthy eating, as a prelude to the main activity of the afternoon: over 40 families got to work and prepared several dishes for a healthy snack, such as vegetable skewers, healthy sandwiches and an endless variety of other treats. Under Ada’s management and a touch of imagination from each family, the snacks came out oh-so-delicious! To remember this special day, all attendees were given a colorful apron and a reusable shopping bag, so that they could continue at home, as a family, to work on the healthy habits acquired over the course of the day. With a full stomach and recharged batteries, the band Xiula, gave a very special touch to this Family Day, making everyone dance, laugh and run around- children and adults alike. It was a great success!